Are Muslims prone to large-scale political violence? Many prominent political scientists have argued that there is a connection between Islam and violence, yet this relationship remains hotly contested. Fish et al contribute to the debate in their recent article in Comparative Political Studies by asking if Muslims are more prone to large-scale political violence than non-Muslims. The authors focus on large-scale intra-state war, rather than terrorism or interstate war, to test this relationship. 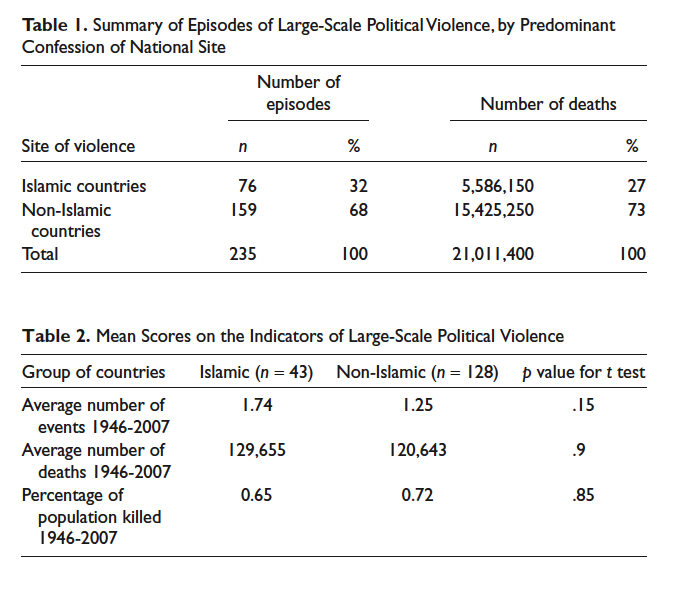 While the authors find no evidence that countries with large proportions of Muslims are more prone to large-scale political violence, they do find “an appreciable, but not necessarily disproportionate” relationship between Islamism (the ideology) and large-scale political violence. The authors explain that many people believe that Islam is associated with political violence because of the concept of jihad, or holy struggle; “If some modern Muslims take to heart what they perceive as permission — even a prescription — to commit violence, one might expect large-scale political violence to be especially high among Muslims.” However, the evidence that they find, after compiling a database of events of large-scale political violence, and controlling for a range of other factors that could affect political violence (level of ethnic fragmentation, level of democracy, late independence) the authors find that only levels of development and democracy are significantly correlated with the number of deaths due to political violence. In fact, they find that Muslims are “less inclined to large-scale political violence than non-Muslims, but the difference is small and not statistically distinguishable from zero.” Instead, they find that 16% of the deaths and 11% of episodes of large-scale intrastate political violence were instigated by radical Islamists (those acting on the basis of a radical ideology). Thus, while “Islamists do bear some responsibility for major episodes of political violence in the postwar world…other actors have been responsible for as much large-scale political violence as Islamists have.” Thus the authors support the fact that Islam as a religion is no more correlated with large-scale political violence than any other faith. Download “Islam and Large-Scale Political Violence: Is There a Connection?” from Comparative Political Studies if your university has access here or email info@pomeps.org for assistance.